Bump, the company that allowed contact information to be shared simply by tapping phones against each other, has released an Android version to its Flock application, which takes photos a user wants to share and post it into a private album for their friends to see. Now, those on iPhone and Android have access to what Color could have potentially been about. Flock (no, we’re not talking about that social media-focused Internet browser), is an app that helps to solve the problem about sharing all those photos you may have taken the night before. Imagine the last time you were at a party or an event and used your smartphone to capture the scene. Maybe it was photos of your friends or the decorations or famous celebrity hanging out with you — if it’s an intimate occasion, it might not be right to share it with the rest of the world. 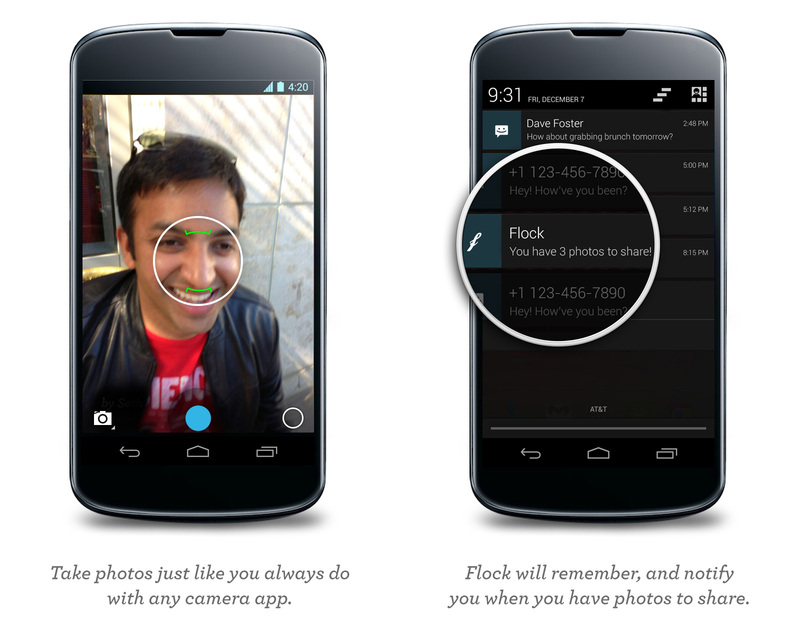 Almost similar to Color, what Flock does is allow users to upload photos, either live at the event or later on. The app doesn’t even need to be open — it can run in the background. It senses who’s near you and pushes photos into a private album. It’s limited to your friends on Facebook so you’re not going to find photos from strangers in your album — using Facebook Connect, the service looks at your social graph and can determine who you’re with and who should be invited to view the album. It’s not a camera app like with Instagram, Hipstamatic, Camera+, or anything like that. Think of it like a photo-specific Dropbox service. Originally available for iPhone, the service is now available for Android. After months of the iOS version being out on the market, the company realized that its thesis about photo sharing was correct: 95% of photos that are taken are never shared and locked away on a friend’s phone never to be seen again. 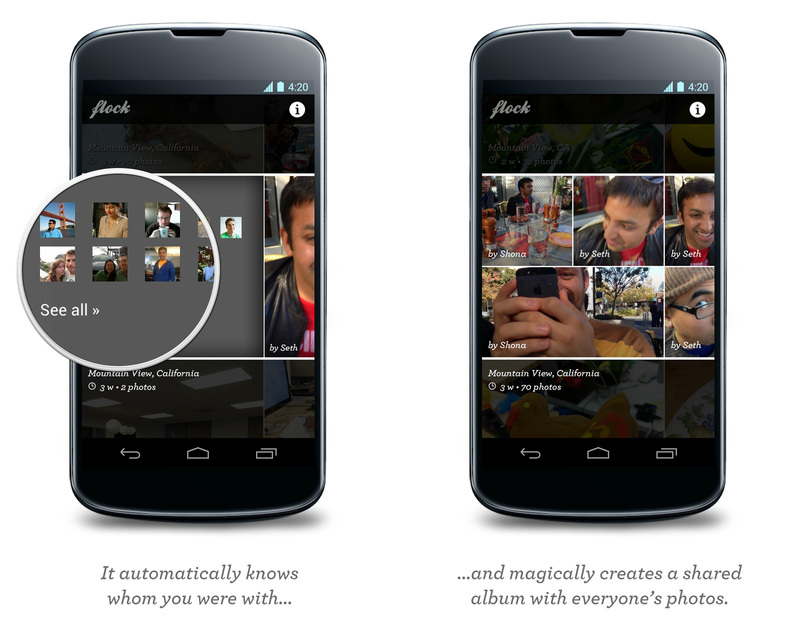 It believes that as a result of Flock for iOS, the average user now gets to view more than 20 photos from friends that they wouldn’t have been able to otherwise. While the service is the same between the iPhone and Android, Bump said that there are two small differences between the versions. With Flock for Android, the screen is a bit bigger so it has a different interface with less chrome and buttons on the home screen. Additionally, from a technical standpoint, the Android version built from scratch a location API and all corresponding functionality — something that came “prebaked” with iOS. The company won’t release its user count, but it does say that there are “fewer than 115 million users than we have on Bump.” It does say that users “love it” and it’s being used at weddings, parties, nights out on the town, and family gatherings. Flock for Android will work for those devices running Android 2.3 and above.